This is just the most simple, delicious, low in sugar cinnamon you’ll find, is just perfection in a bite. And I have the challenge to make any recipe with pumpkin and happened the I have a can of pumpkin puree, I need it to use it ASAP, this theme was perfect for me. So, I made this amazing rolls, not your typical cinnamon roll, no, this is beyond that. I personally love this recipe, because, is very low in sugar, so when you eat this rolls is not gonna be over sweet. And the best part you can eat it with or without a frosting. I hope you love them as much as I and enjoy at any hour of the day. One of the things that bring up memories of Autumn is Pumpkins! Whether it be a family trip to the pumpkin patch or the first time you sipped a pumpkin spice latte. We are excited to share with you this collection of amazing Pumpkin themed posts from many of our outstanding members here in the Social Fabric community. We know that you will enjoy them and hope that you can create some new fall memories for yourself and the ones you love. Can you believe all these incredible Pumpkin posts? Bookmark this page so you can come back and try out all the recipes, crafts, and activities with you and your family! Check back next month when Social Fabric features posts with a cranberry theme. 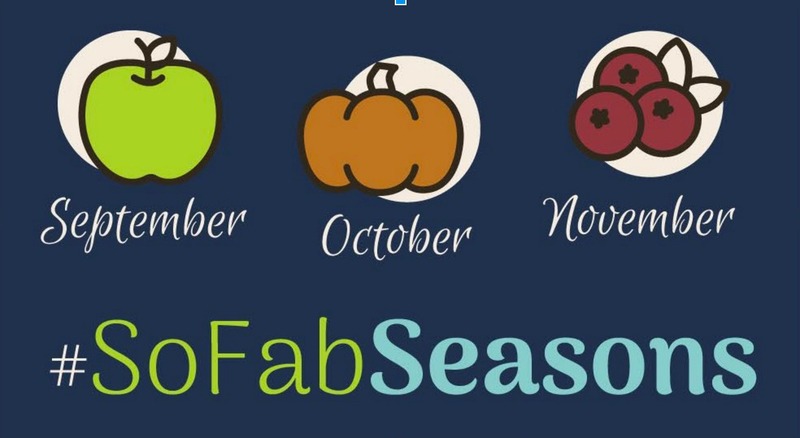 You can always search the hashtag #SoFabSeasons to find more of what you’re looking for! So good, so easy and not your typical everyday rolls. Preheat the oven to 400 degrees. In the bowl of a stand mixer, combine the yeast and the warm water, let it rest for 5 minutes, then on low speed add honey, eggs, and butter, still, on low speed add salt and the flour 1 cup ad the time until the dough pulls away from the sides of the bowl. Once ready, place the dough in a lightly flour surface, roll out to form a rectangle, then start with the filling, first spread the pumpkin puree and after that sprinkle the cinnamon, brown sugar and the pecans. Roll in the dough and cut in 1" pieces, about 30 small pieces or 22 medium pieces, that is up to you. Place in a grease baking dish. Cover with a towel and let it rise for 20 minutes in a warm place. Before baking spread some melted butter. I want to start by asking all of you, what are your plans for the Big Game? What is that something you want to make and haven’t found it yep? Well I have the answers for you and all is very simple. Today I want to share this perfect, delicious and super inspired recipe so you can enjoy and share with all your friends while having some awesome game day food. Yes, this rolls are just what you need to be ready for the party and not being worry about it. You know as a latina we love sports and we are very competitive, my family for example is always looking for the ultimate snack to take to my mother’s house to watch t.v. and as the year gone by we have made it a good competition, you know just part of the game and to have fun. Well this year I made this rolls with chipotle cream, and I use one of my favorite ingredients Chipotle Peppers in Adobo Sauce La Morena, the kind of heat you will get from this rolls is just the perfect amount you need to enjoy the entire game, picante delicioso, that’s what my father always used to say. And I know as a customer of La Morena I love quality and tradition, just as their philosophy implies. Now I want to share with you where I can find La Morena products, and let me tell you this is one of my favorites supermarkets for all things Latino, this is where I by all my favorite goodies; ok so just find your nearby Northgate Gonzales Supermarket and you will find all kinds of La Morena products, so if you want to change the rolls a little bit, don’t worry and go ahead, I would love to read how you can adapt the recipe using other products. Easy, rolls stuffed with a delicious chipotle cream and bake to perfection. Preheat the oven to 350 degrees. In the bowl of a electric mixer add, water, yeast, egg yolk, oil, salt and sugar, and combine for 2 minutes, add the flour and combine until a soft dough has form. Place the dough in a lightly greased bowl and let it rest for 30 minutes. To make the filling just mix together, cream cheese, salt, ranch seasoning, chipotle in adobo and mix until well combine. Divide dough in two, spread in rectangular form, spread half with chipotle filling, sprinkle half the peppers and cilantro and form a roll. Cut 12 thick rolls place them in a large pan of cupcakes, greased. Let rise for 15 minutes. Bake for 25 minutes. You can serve hot or at room temperature. Ideal for holidays, or for watching sports. And this week our host for #SundaySupper Heather from girlichef, give the challenge to make any recipe with squash, and happened the I have a can of pumpkin puree, I need it to use it ASAP, this theme was perfect for me. In the bowl of a stand mixer, combine the yeast and the warm water, let it rest for 5 minutes, then in low speed add honey, eggs and butter, still in low speed add salt and the flour 1 cup ad the time until the dough pulls away from the sides of the bowl. Once ready, place the dough in a lightly flour surface, roll out to form a rectangle, then start with the filling, first spread the pumpkin puree and after that sprinkle the cinnamon, brown sugar and the pecans. Roll in the dough and cut in 1″ pieces, about 30 small pieces or 22 medium pieces, that is up to you. Place in a grease baking dish. Cover with a towel and let it rise for 20 minutes in a warm place. Before baking spread some melted butter. Bake for 25 to 28 minutes. And if you are hungry for more, check this recipes, they are to die for too.